It’s been a historically peaceful summer in Lawrence with violent crime down nearly 50% and murders (so far) this year down by 2/3. Since the beginning of the year Lawrence residents have enjoyed safer neighborhoods and a better business environment for local merchants. The current murder count in Lawrence is three. Two of those murders (the Hampshire St. execution on June 6th and the 550 Broadway shooting on May 2nd) have not been solved. The one murder that was solved was the brutal and savage stabbing on Doyle Street where the killer was still on the scene when police arrived. Last year at this time there were nine murders in the city and daily calls of shots fired with dozens of people each month showing up at the hospital with gunshot wounds. So far this summer there have been very few gunshot calls, as a peaceful calm seemed to settle over Lawrence though most of May, June and July. All of that changed late this week with several police calls of “shots fired” and a surprising uptick in the number of police calls of violence. Thursday night a man on Alder and Juniper St. was shot, the initial call that went over the scanner was that he was down on the ground, but seconds later the police dispatcher informed officers on their way to the scene that the victim got up and ran towards Lawrence Street. After an extensive search he was later found without any gunshot wounds, but shell casings were found at the scene. Later the same night, two more calls for shots fired were dispatched but no victims were found. On Friday night, a man was beaten with a baseball bat and stabbed with a knife on Juniper Street, just feet from Thursday night’s shooting. The victim was brought to Lawrence General hospital, his condition was not released. The Alder and Juniper Street neighborhood is the center of gang territory in Lawrence. 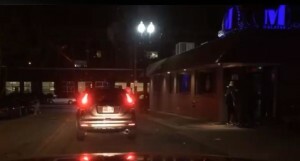 Minutes after that violent assault, a car to car drive by shooting occurred just a few feet over the Lawrence line in Methuen on Tenney Street just a minutes before midnight. All units of the Methuen police were sent to the scene and Tenney St. was shut down. Sgt. McMenamon and on-duty detectives also responded finding five .40 caliber shell casings on Center Street in front of Polanco Market. A preliminary investigation determined based on evidence found at the scene, witnesses, and video of the incident showed two vehicles traveling south on Tenney St., met side by side in the area of 65 Tenney St. The vehicles were a light colored sedan and a dark colored sedan. Some report the light car as a Nissan Altima, some witnesses described it as an Acura. The dark colored car was described as a Camaro or a Maxima, or possibly a Charger. After a short time the vehicles continued south on Tenney St. as the light colored car accelerated and passed the dark car. As it came to the intersection of Center and Tenney St. a male leaned out the window of the light colored car and began to fire at the dark colored car. Police received video from Center St. and Tenney St. which captured some of the incident and supported witness statements. As a result of the suspect leaning out of the window and firing from the light colored car, a bullet entered the southern wall of a home at 65 Tenney St. The bullet entered the living space of the residence and stopped on the floor, a short distance from where a 5 year old child was sleeping. The bullet was recovered by state police and casings were found. Massachusetts State Police photographed the scene and are assisting in the investigation. On the other side of Methuen (East Methuen), officers responded to to the area of Olive St. and Boston St. for a call of several loud noises that woke up neighbors. Upon arrival police say they discovered two vehicles with bullet holes parked on Olive St. near the intersection of Boston St.
Officers canvassed both streets and spoke with neighbors, nobody was injured. Police say that a 2011 Honda Civic owned by Luis Gonzalez was the intended target vehicle. The vehicle of a second victim, Woldine Moise of Methuen, was also struck once by a bullet. Police believe that the shooter left the area via Boston St. heading towards Vermont St. While searching the area police discovered two shell casings and a loaded round on the ground near the damaged vehicles on Olive Street. Not far from that live round police discovered a black plastic garbage bag containing several more empty shell casings in front of 91 Boston Street. Shell casings recovered were .223 rifle rounds. Police say that the plastic bag had a hole in it saying it appears the suspects fired the weapon from inside the bag. Officer Getchell was called to the scene with his canine “Buddy” and did an area search. Nothing further was found. Shortly after the 2am last call for Lawrence nightclubs Saturday morning, The Valley Patriot was stationed at the corners of Mill and Essex Streets, and Newbury and Essex where half a dozen Lawrence cops were conducting what they call “impact patrol” to stem the pattern of fights and violence of last call patrons all leaving the night clubs at the same time. Police chased a dark colored vehicle down Methuen Street to Union St. and into South Lawrence where the shooter made his way to Rt. 495 South and was able to get away. Police found no shell casings as is usually the case when a gun is fired from inside a vehicle. Surprisingly nobody was hurt. “Can you believe that? 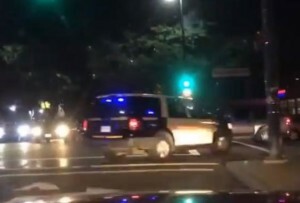 The guy drive right past us and shot into a big crowd of people and he didn’t hit one person, we got lucky tonight,” one officer was overheard saying to a supervisor. One Response to Shootings, Stabbings, 2 Nights of Violence Shatters Peaceful Summer ~ PAYING ATTENTION EXTRA!